If you are subjected to the inconvenience of an overbooking or denied boarding, the plus side is that you may be due between €250 and €600 in compensation as well as some additional services and benefits at the airport. If you meet the conditions as set out in the EU Passenger Rights Regulation, then you have a valid claim. Use our online compensation calculator to check whether you are entitled to compensation and then get Flightright to enforce your claim at the touch of a button. What are my rights in the event of an overbooking? What should I do if my flight is overbooked? Collect proof: Photos, receipts documenting any expenses incurred, tickets, vouchers etc. What does overbooking and denied boarding mean? It is a common practice amongst airlines to overbook their flights. They often sell more tickets than there are seats on the plane and if they do not find enough volunteers to surrender their reservations they may deny boarding to passengers against their will. Similarly, airlines sometimes use a smaller aircraft, especially if there have not been enough bookings on the flight, to keep it profitable. In this case, some passengers may be placed on other flights. A compensation for overbooking is due to the passenger who was denied boarding against his or her will when he or she had checked in on time, the travel documents were complete and there was no security or health risk to the flight or other passengers. When do passengers receive compensation for overbooked flight? If you were denied boarding against your will due to an overbooking of your flight, you may be entitled to compensation between €250 and €600. Note that the price of the ticket for the initial flight does not affect the amount of compensation. According to the European Passenger Rights Regulation, you can claim compensation even if you have booked your ticket with a low-cost airline. If you suffered a denial of boarding due to an overbooking as a business traveler you are entitled to the compensation, and not your employer. Passengers who travelled on package holidays are also able to claim. For your claim to be eligible the flight must depart within the EU or, if it lands in the EU the airline must have its headquarters in the EU. It is possible to claim on flights as far back as 6 years. Did you check in on time? In order to receive denied boarding compensation, you technically have to check in on time. The German Federal Court of Justice, however, recently passed a mild ruling on check-in in favour of consumers (case reference X ZR 34/14): If the airline previously made it absolutely clear that the passenger would be denied boarding on the booked flight then, according to the Federal Court of Justice, passengers do not have to travel to the airport — but are nevertheless entitled to compensation. We nevertheless recommend that you travel to the airport, especially in cases involving flights that are rebooked at short notice. Even if passengers are faced with long waiting times, they should not leave the gate area in case they miss information on sudden flight changes. What if my flight was rebooked? Flight rebooking happen mostly during package holidays. It’s either the flight time changes or passengers are booked on a completely different flight. If you arrive later at your final destination or you depart earlier than originally booked, you might be eligible for compensation as well. How do I apply for compensation if my flight is overbooked? The first the thing to do is confirm that you are actually eligible for compensation. The airline that actually operated the flight needs to be contacted as they may differ from the airline where you booked your flight. Indeed, it is the airline operating the flight that normally has to compensate you in the event of a denied boarding. This rule also applies to passengers who have participated in a tour package, they must contact the airline and not the tour operator. Simply enter your flight details into our compensation calculator and you will know the amount of your potential compensation within minutes. But sometimes it is easier said than done. Many passengers tell us that it is extremely difficult to find the airline's contact person, especially when dealing with a foreign airline. Sometimes even the customer service doesn't respond to inquiries and these can get many passengers to give up on their pursuit. However, with the help of Flightright, Europe's No. 1 expert on air claims, the chances of getting your compensation are enormous. We have already negotiated with over 318 different airlines and so far obtained more than 200 million euros for our customers. If the claim check indicates that you are eligible for compensation for your overbooked flight, you can have us asserting your rights to claim immediately. The best chance of receiving your compensation in a hassle free manner is to sign your case over to us. We know what the airlines are like and what moves they typically use to avoid paying passengers their due compensation. Our knowledge of the industry allows us to represent our customers’ interests on a level playing field with the airlines. We’ll make sure that you get the compensation you’re entitled to, even if it means going to court. We currently boast a 98% enforcement success rate, while we operate a no win no fee basis, meaning that we only receive a commission of 25% + VAT if we win your case. Which rights do I have at the airport when my flight is overbooked? If a sudden flight overbooking occurs and you have to wait at the airport, it is mandatory for the airline to provide assistance to passengers. Regardless of the cause of the cancellation you are entitled to receive basic assistance at the airport. Passengers must receive food and drinks as well as two free phone calls, faxes or emails. If your flight is overbooked you can choose between an alternative transport or you can opt not to fly at all and to receive a refund for the price of your ticket. If you are already at the airport when you find out that you are denied boarding and have been rebooked to a flight departing the next day, the airline has to provide you with hotel accommodation and pay for your transfers to and from the airport and hotel. You should always try to get this confirmed in writing from the airline. Airlines usually book this overnight accommodation themselves and then provide you with the details. So speak to the airline first before you go ahead to book a hotel for yourself. How to protect my rights on a future flight? 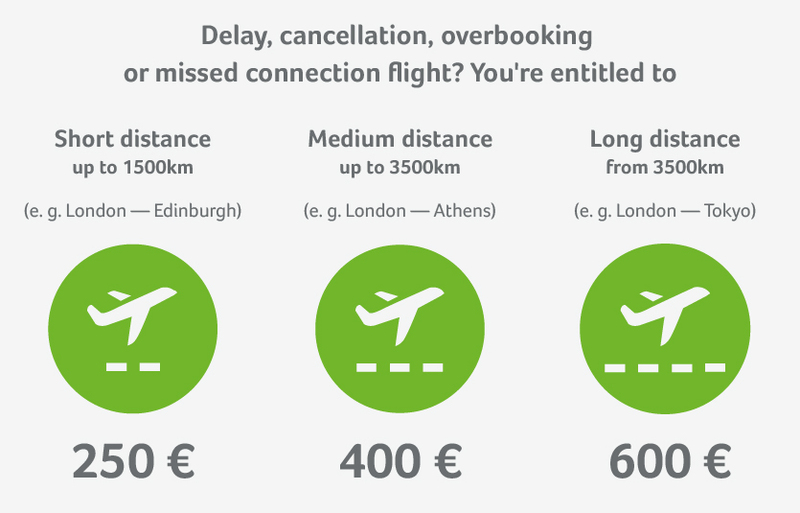 You have planned a flight trip in the future and want to be sure you won't miss any compensation payments in advance? No problem. You can enter your flights in advance in our compensation calculator and we will inform you if you are entitled to compensation. A delayed flight isn’t something you just have to accept. Our guide shows you when you are entitled to compensation. You can also find out what you are entitled to if your departure is delayed and in what circumstances you can opt not to fly at all. Was your flight cancelled just before you were set to depart and brought forward or delayed by several hours or even days? Then take a look at our flight cancellations guide. You can find out not only when you are entitled to compensation but also whether you should book another flight at your own expense and when you can opt not to fly at all. Travellers who missed their connecting flight due to a (slightly) delayed previous leg are also protected by the EU Air Passenger Rights Regulation. They are entitled to compensation from the airline. In order to receive this compensation, the two flights must be part of the same booking. Flightright's passionate founder makes it possible for your to claim compensation one on one with airlines through a high-quality and risk-free legal service. Phillip is well-known for his travel expertise from various interviews. Ryanair, Easyjet, Flybe, Jet2, Thomas Cook Airlines, British Airways, Thomson Airways.